320 pages | 100 B/W Illus. Research on bone remodeling has resulted in much new information and has led to improvements in design and biomedical practices. 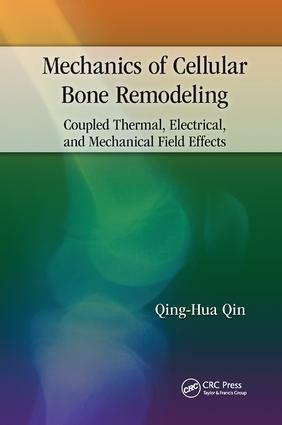 Mechanics of Cellular Bone Remodeling: Coupled Thermal, Electrical, and Mechanical Field Effects presents a unified exploration of recent advances, giving readers a sound understanding of bone remodeling and its mathematical representation. Readers will benefit from the thorough coverage of general principles for each topic, followed by detailed mathematical derivations and worked examples, as well as tables and figures where appropriate. The book not only serves as a reliable reference but is also destined to attract interested readers and researchers to a field that offers fascinating and technologically important challenges. Qing-Hua Qin received his bachelor of engineering degree in mechanical engineering from Chang An University, China in 1982, and his master of science and Ph.D. degrees in applied mechanics from Huazhong University of Science and Technology (HUST), China in 1984 and 1990, respectively. He is currently working as a professor in the Research School of Engineering at the Australian National University, Canberra, Australia. He was appointed a guest professor at HUST in 2000 and was a recipient of the J. G. Russell Award from the Australian Academy of Science. He has published over 200 journal papers and 6 monographs.